The selfie trend seems to be one that is here for the long haul and as the years go by, today’s Gen Y and Z seem to find deeper gratification and even a sense of self-worth by living in a digital platform, sharing cleverly positioned and enhanced images with online viewers in a bid for likes, comments and shares. Key findings from INTI’s landmark survey on Gen Z conducted in 2015 further reinforces this trend with close to 94% of internet surfers from the survey being on social media sites like Facebook and Twitter, spending more than eight hours a day on the internet. As part of a class project on understanding the role of digital representation, 33 Foundation in Arts (Communication) students of INTI International University Nilai, worked together to create awareness of how digital traces that people leave behind on social networking sites create identity formation that extends to every facet of an individual’s life and how that impacts the individual and even society to an extent. 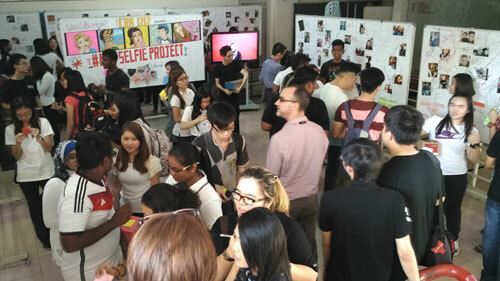 The event, aptly named #INTI Selfie Project, was an interactive mini exhibition where all 33 students showcased five different selfies taken from their own profiles from various social networking sites. They were tasked to describe the meaning behind each selfie after having received feedback from their observers during the exhibition. 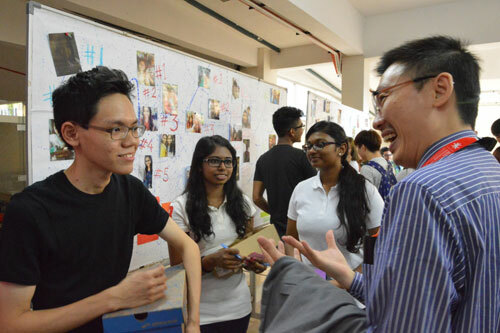 The feedback exercise helped these students discover their online and offline identities, understand people’s perception of them, notice the variances from people’s point of view of the images they shared and further gain insightful feedback from fellow course mates, friends, lecturers and other event attendees. Officiated via a selfie with Dr Jagdeep Singh Jassel, Dean of INTI International University Nilai’s Faculty of Business, Communication and Law, Mr. Mohd Shahriel Abd Rani, Head of Programme (Foundation in Arts), Ms. Cheryl Withaneachi, Lecturer for Digital Communication, and the project directors, Nur Alia bin Nazri and Alvin Hoo Yan Weng, the event was a hit and garnered participation of over 300 INTI staff and students. “We have so many identities that we want to portray online, that sometimes we get lost in them and think that those identities are the “real” us, when it actual fact, it is not,” shared project director, Nur Alia, who found the event to be an eye opener. The #INTI Selfie Project was a great social awareness exercise for today’s young generation in understanding how posting personal content online can have dire consequences further to making them mindful of their posting behavior based on what they intend on portraying to their specific audience. It helped students understand how identity formation occurs and how things posted online via various social media platforms can be interpreted differently from what was intended. Through the exhibition, students also learned to develop critical skills like communication and collaboration. It was also a means of increasing self-confidence and expression by engaging in conversation with fellow exhibition attendees to eloquently explain their understanding of identities and its impact on individuals and society.